Mad Santa! This year our Bloody Santa has been hit with his sleigh and gone mad – he decided to give away additional presents! We would also like to thank you all for supporting BloodWars. Especially with all the things we have prepared for you. 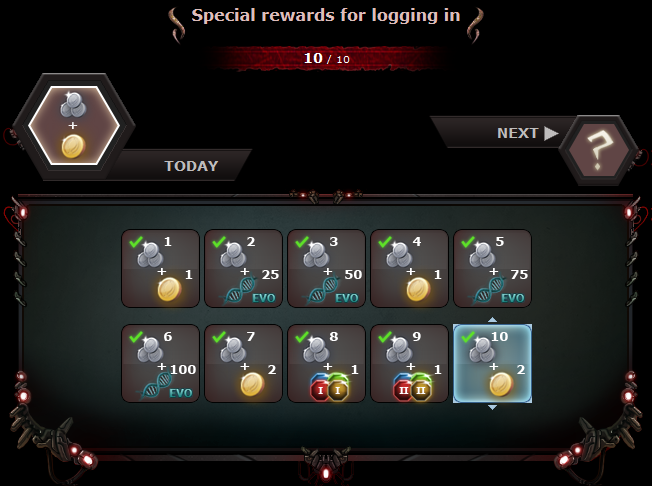 24.12.2017 – 02.01.2018 Christmas logging bonuses. When logging in between 24 December and 2 January, you unlock new levels of prizes. 21.12.2017 - 31.12.2017 Charon’s madness! Due to the disturbance in the magnetosphere caused by the activity of the Sun, buildings, prefixes, suffixes and set bonuses will stop working in PvP. WARNING! Item requirements remain the same. You might want to stock up on those knives and clubs! 22.12.2017 - 23.12.2017 Seekers’ Day. 24.12.2017 - 26.12.2017 Souvenir Shop. Your favourite trader is back! 27.12.2017 - 31.12.2017 Cain’s Holiday Vision Deluxe. Even more luck and 2 times more evolution points for each attack! Bonus: +50% CHANCE FOR A RUNE! 1.01.2018 - 2.01.2018 Night of Heroes. No monster can feel safe tonight. Due to the fact that we were in a hurry to make the patch ready for Christmas, it will be marked as Beta. If you have any comments about the balance, please share them with us via the forums. With this new stat, you will be able to counter the omnipresent defence-ignoring effects. It will be given to the strongest armours, trousers, defensive affixes and, of course, monsters whose defence should be their biggest strength. The last three opponents from the second expedition map. These will be the most powerful and difficult demons ever encountered in BW. Their mechanics are tuned in such a way that you will need the might of your whole clan combined with the most powerful server events to take them down and it will still be extremely difficult. We are aware that many of you have completed your evolution trees. That is why we are introducing a new level of evolutions. It will also allow you to activate a FIFTH rune in talismans. A new tab in the armoury will allow you to see and manage all your items. 4 new events related to the effects of Talismans... or lack thereof. Some will activate all racial Talismans, others will activate non-racial ones. Some will even disable Talismans altogether! Crafting Epics 1.0 and legendary items on Underworld. We are introducing the long awaited Epic items to Underworld. You will have to make them on your own – trading them will not be possible. It will also be possible to add the Legendary trait to items without it.